Teeth whitening is a way to improve the colour of your teeth using hydrogen peroxide (a type of bleach). It is safe and effective if carried out by a dentist or under the supervision of a dentist. Teeth whitening does not remove any of the surface of the teeth or add anything to the teeth. What happens which teeth whitening treatment? A low but highly effective concentration of hydrogen peroxide (bleach) will be applied to your teeth using specially-made top and bottom trays that fit snugly around your teeth. You will be shown how to fit the tray and the gel so that it can be used at home. These trays will typically be left in your mouth overnight. In most cases, yes. However, tooth whitening treatments work differently depending on the shade of your teeth at the start of treatment. Also, the treatment doesn’t suit everyone and may not work for some people. If your teeth are likely to be difficult to treat, your dentist will tell you beforehand. 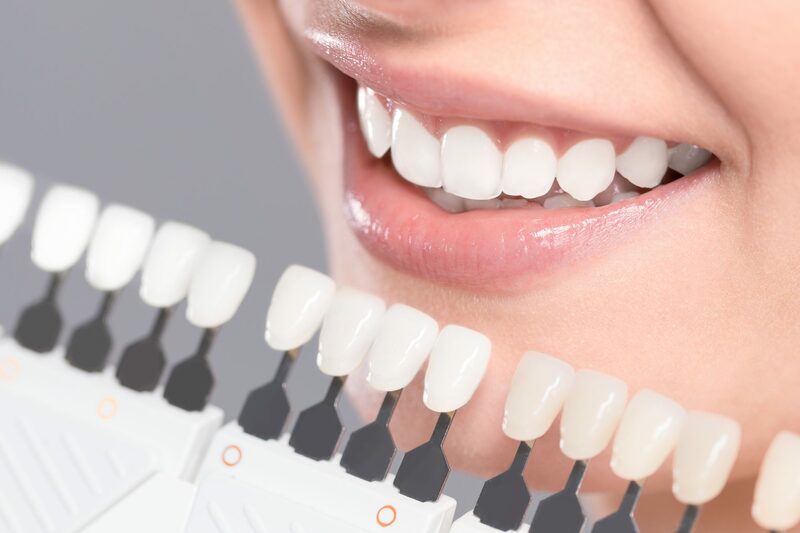 Tooth whitening carried out using the instructions provided by your dentist is perfectly safe. The dentist will examine your teeth thoroughly, check your oral health history and decide whether teeth whitening is right for you. As with any dental or medical treatment, teeth whitening must be tailored to your needs. There is no ‘one size fits all’. Tell your dentist what you want teeth whitening to achieve and any concerns you may have. Your dentist will guide you towards the right treatment for you. How long does the treatment and effect last? Most people will use the trays for at least two weeks but this varies from patient to patient. Teeth whitening treatment is a gradual process. It could take a number of weeks to achieve the result you want. Your dentist will explain how long you can expect treatment to last. It will be dependant on your diet and oral hygiene, but on average it can be 1 to 2 years. Teeth whitening prescribed and supervised by your dentist does not harm your teeth or general health. Sometimes, irritation inside the mouth. These side effects usually disappear a few days after stopping treatment but can sometimes last for up to a month. Your dentist can help you to deal with any side effects.